Nowadays, business requirements are getting more intricate. The industry replies to the situation by paying attention to the management of the business structure, counting product planning, cost, manufacturing, marketing and sales. Epicor classifies an innovative loom to the design and distribution of its ERP solutions that motivates industry to invent business and increase output. Every distributor needs an effectual costing strategy and the tools to guarantee its execution on a regular basis. Although there are numerous pricing approaches, not all are thriving when it comes to unraveling the extremely multifaceted, yet exact pricing requirements of distributors and their sales forces. Today, Epicor offers numerous ERP products and solutions such as Epicor ERP, Epicor HCM, Customer Relationship Management and Epicor Retail Suite to the business clients. This scenario creates an enormous challenge for business leaders belonging to the Epicor landscape when looking for service providers to assist with consulting, implementation, and support. To simplify and help CIOs navigate the Epicor solutions landscape, CIO Review is coming up with annual special edition on most promising Epicor Solution Providers where a distinguished panel comprising of CEOs, CIOs, and VCs analysts including CIO Review editorial board will decide the “20 Most Promising Epicor Solution Providers 2015” in the U.S. listing the best vendors and consultants who provide key technology solutions and services related to Epicor products. 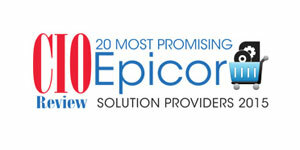 In the process of selecting the most promising Epicor Solution Providers 2015, we have analyzed the company’s offerings, core competence, news/press release, client’s testimonials and several other recognitions. Alternative Technology Solutions Alternative Technology focuses on enhancing the clients ROI on their Epicor ERP investments. CapApex CapApex leverages Epicor in end to end business processes, such as distribution, professional services, robust business intelligence for fast-developing and multinational companies. Clients First Business Solutions A partner with Epicor's global ERP platform which combines consistency and adaptability while making every business a true competitor. CompuData An Epicor partner which help Epicor clients leverage the Epicor ERP as a fully customizable platform for enterprises. ComTec Solutions As Epicor's platinum partner Comtec Solutions leverages Epicor for eliminating the technology, integration, and accessibility barriers that stifle productivity. Data Communication Solutions An Epicor partner with a detailed focus on Epicor ERP version 10. Data National Corporation Being a silver partner with experience in hosting Epicor's CMS and interacting with Epicor's CMS ERP applications. Data National has developed expertise to host, monitor and manage mission critical application systems around the clock. Datix Inc Datix, deploys a unique Epicor implementation process to enable the full power of Epicor ERP for clients. EC Solutions A provider of leading business solutions resulting in increased productivity and a proven return on investment on Epicor ERP. Encompass Solutions An Epicor platinum partner leveraging the Epicor ERP for enhancing operations in CRM, Product Lifecycle Management, Field Service, Data Collection, supplier relationship management and others. EpiCenter An ERP consulting company specializing in implementation, optimization, and scaling market leading ERP platforms, like Epicor, for business needs. Estesgroup EstesGroup’s primary business focus is to provide small, medium and large Manufacturing/Repair, Distribution and Professional Service organizations consulting services to implement/use the Epicor ERP system. HRMS Solution HRMS automates HR processes through Epicor HCM, enabling to track, manage and analyse all employee data from application to retirement. HRMS also provides solutions to manage Payroll and Talent management solutions. Jitterbit Jitterbit has partnered with Epicor for addressing critical business challenges such as integration by deploying solutions that are easy to use, quick to implement and tailored for your organization’s unique requirements. Paramount Technologies Leveraging Epicor platform, Paramount Technologies provides a web-based and mobile portal for processing and accessing critical financial transactions from the Time of Purchase requisition to posting in Epicor Financials. RiSOLVE Technologies RiSOLVE, as a software solution provider, works across domains including Manufacturing, Distribution, Retail, Oil and Gas services by providing CRM, Sales, Finance, SCM, Production, Planning and Scheduling, Project, Maintenance and HCM. Saberlogic SaberLogic provides support services for customers who run Epicor ERP and enable them to take advantage of Epicor's amazing ability to be customized and integrated. Strategic Pricing Associates SPA is a provider of pricing analytics to enterprises belonging to manufacturing, distribution, equipment, services, besides many others. viaPro A provider of business management solution that helps companies implement IT based business management systems, improve business processes and create innovative solutions.